"At this year's Consumer Electronics Show in Las Vegas, Microsoft announced that Windows 8 will support system-on-a-chip architectures using ARM processors. Unlike the x86 architecture that today's Windows laptops and desktops work with, ARM-based chips tend to run such low-power devices as tablets and smartphones. In his CES keynote speech, Microsoft CEO Steve Ball­mer said, "This announcement is really all about enabling a new class of hardware, and new silicon partners for Windows, to bring the widest possible range of form factors to the market." In other words, Windows won't be just for laptops and desktops anymore." The next Windows operating system is due out in 2012 and rumors that it's going to be a game changer have accelerated since CES. Code named "I Hope it's Not Too Buggy," the new system is meant to address an entirely new set of devices, including TVs, smart phones, notebooks, and tablets. The themes are clear and important for Microsoft to get right: virtualization for ease of use, quick starts and portability, and a focus on untethering devices and storing settings, apps and data in the Cloud. There's talk that Microsoft will launch a new developer framework and support it's own app store to push the system even further. I'm sure whenever Microsoft launches a new OS, the folks at TWBA Worldwide start to lick their chops. They're the smartypants who created Apple's "Get a Mac" ad campaign which successfully ran from 2006 to 2010 and sarcastically tweaked Microsoft's prowess in building elegant operating systems. So, will Windows 8 be Microsoft's clever retort? 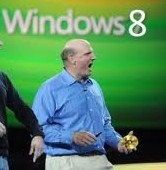 Will Windows 8 join Android and Apple O/S and a viable third choice for developers? Ultimately, will this put Microsoft back on top with consumers?